In May 2018 Jo Jolliffe contacted the site asking for information about Elizabeth Geldart of Grewelthorpe. Just checking whether there’s any research about the Geldart family. Elizabeth aged 70 and her daughter Elizabeth aged 40 were living in Grewelthorpe in 1841. She was an agricultural worker at the age of 70!! Jo is also asking for photos. I’d like to make an appeal for any photos your readers may have, of any of the Geldart; Close or Walker Family. In particular I’m looking for any photographs of Margaret Close, the wife of William Michael Walker or their children, including William, Emma, Marjory (Madge), Gertrude, Elizabeth. I hope someone in Grewelthorpe or connected to Grewelthorpe might have one or any of them in their photo album. This surname, long associated with Yorkshire, is of early medieval English origin, and is an occupational name for a tender of oxen and gelded horses. Found in the census returns and other records. Mr. A. GELDART. 1883. Owned a house and a shop in Boroughbridge which was almost swept away in the big flood of Feb. 1883. Ref. Pateley Bridge & Nidderdale Herald 1883. ALBANY GELDART. Born 1 June 1856 Boroughbridge. Died 1915. Son of John & Ann. He was a Draper. Married to Mary Jane Tunstall. in October 1879. MR. A.V. GELDART. 1940. Became a Ripon Justice of the Peace. 1955. Chairman of Ripon City Magistrates, appointed a Magistrate member of the West Riding Standing Joint Committee. [Ref. Yks Post April 1955]. AMY MARY GELDART. Born C1866. Died 31st August 1945 Harrogate. Youngest dau of John [Cordwainer]of Boroughbridge & Ann. Married 26 June 1893 at Wesley Chapel, Boroughbridge. to Frederick William Scruton. Chemist of Minskip. By 1911 they had had 5 children. ANN GELDART. Born 17 August 1760 West Tanfield. Dau of William & Jane Ellerton. ANN GELDART. Born 1828 West Tanfield? Dau of John & Mary Hodgson. CHARLES GELDART. Died 1914 in Oxford. Son of Rev.J.W.Geldart of Kirk Deighton. CHRISTOPHER GELDART. Born Feb 1749 West Tanfield. Died 1832 West Tanfield. Son of William & Jane Ellerton. Married Dorothy Abbot. 1 Nov 1773. W.Tanfield. They had 8 children. The signature of Elizabeth Geldart on her will in 1773. Samuel Wrather & John Spence were executors. ELIZABETH GELDART. Born C 1772. Well. Living with son Thomas in Azerley in 1851. ELIZABETH GELDART. Born 1784 West Tanfield. Dau of Christopher & Dorothy Abbot. ELIZABETH GELDART. Born C 1798 Grewelthorpe. Sister of William. Unmarried in 1861. ELIZABETH GELDART. Born C1838. 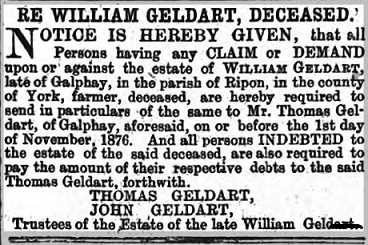 Died 19 October 1862 Northallerton. Aged 24. Ref. York Herald. 1862. ELIZABETH GELDART. Born C 1841 Kirkby Malzeard. Dau of Thomas.of Azerley. Married James Close. in January 1863. They had 8 children. ELSIE GELDART. Married to Harry Greene. June 26 1929 in Leeds. Lived Harrogate in 1954. EMILY GELDART. Born C1861 Boroughbridge. Dau of John [Cordwainer] & Ann. GEORGE GELDART. Born 30 July 1758 West Tanfield. Son of William & Jane Ellerton. GEORGE GELDART. Born C 1838 Ripon. Married Elizabeth Nicholson. of Masham [b.C1854 Masham] in 1889. George was a Tanner. They had 1 child who had died before 1911. Living Pontefract 1911. HENRY CHARLES GELDART. Born 1840. Died July 13 1912 in Nice. Lived Huntingdon. Son of Rev.James Wm. Geldart. rector of Kirk Deighton & Mary Rachel Desborough. Called to the bar 1st May 1865. He was Sheriff of Cambridgeshire & Huntingdonshire 1887-1888. He was involved in the celebration of Queen Victoria’s Jubilee in 1887. Comment from Munich in July 2018. re Henry Charles Geldart. 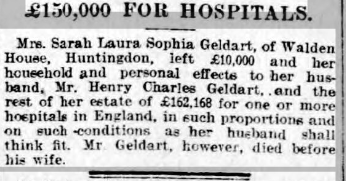 I am the descendant of Laura Geldart (1857-1913), married to Henry Charles Geldart born 26/04/1840 in Hundingdon and died in Nice on July 13, 1912 in Nice., I am looking for a photo of Laura. Maybe you can help me. Rev.JAMES GELDART. Born 1760 Masham. Died 12 Nov . 1839. Kirk Deighton, Wetherby. Son of Richard. Married  Mary Ann Nicholas. married  Sarah Williamson. All Saints Church Kirk Deighton. REV. JAMES WILLIAM GELDART. Born 15 Feb 1785. Swinnow Hall Wetherby. Son of Rev.James Geldart. 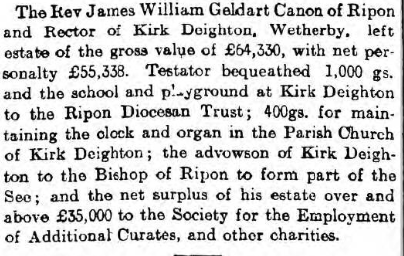 Rector of Kirk Deighton Died 16 Feb 1876. Buried Kirk Deighton churchyard. He was educated at Beverley Grammar School. He married 4 August 1836 to Mary Rachel Desborough. His wife was born 1808 and died Dec. 1890 age 82. Canon JAMES WILLIAM GELDART. Born 16 April 1837. Died 12 May 1914 on his way to South Africa. He was buried at sea. He was the eldest son of Rev.J.W.Geldart of Biggin Grange & Kirk Deighton Wetherby. & Mary Rachel Desborough Grandson of Rev. James. 3 Generations of family had been there. He was educated at Leamington College & Trinity Hall, Cambridge. 1859 Ordained Deacon. 1860 1st curacy at Wheatley. 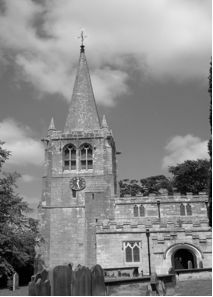 1862 went to assist Father at Kirk Deighton . Father died 1876. 1886-1909 Rural Dean of Wetherby. 1906-1909 Honorary Canon of Ripon Cathedral. He married twice. Married 1 August 1878 to Ann Buxton. who died in childbirth in Feb.1880. 2nd marriage to Mary Rosa Bealey of Harrogate. Newspaper report 1914. 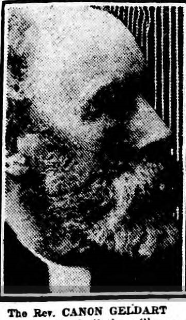 Photo of Canon Geldart in 1913 aged 76. JANE GELDART. Born 26 Sept 1767 West Tanfield. Dau of William & Jane Ellerton. JANE GELDART. Born 1777 Masham. Died 10 August 1816 Masham. Dau of Christopher & Dorothy Abbot. Married Isaac Towler. of Masham on 17 October 1807. JANE GELDART. Born C 1843 Kirkby Malzeard. Dau of Thomas of Azerley. JOHN GELDART. Born 8 Dec 1753 West Tanfield. Son of William & Jane Ellerton. JOHN GELDART. Born 1782 West Tanfield. Son of Christopher & Dorothy Abbot. JOHN HODGSON GELDART. Born C1821 West Tanfield. Possibly son of John & Mary Hodgson. Married Esther Mary Buck. They had 6 children. JOHN GELDART. Born C1827 Kirkby Hill. Master Cordwainer. Married to Ann. Lived High Street Boroughbridge. MARGARET GELDART. bap 1782 Masham. Dau of Thomas & Ann. MARY GELDART. Born 31 Oct. 1751 West Tanfield. Died 1752. Dau of William & Jane Ellerton. MARY GELDART. Born 1756 West Tanfield. Dau of William & Jane Ellerton. MARY GELDART. Born 1787 West Tanfield. Dau of Christopher & Dorothy Abbot. MARY ANN GELDART. Born 1828. Died 1893. Dau of John of West Tanfield & Mary Hodgson. of Middleton Tyas. Married Edward Swales. of North Stainley in 1851. He was a Tailor & Sub Postmaster. MARY ANN GELDART. Born C1843. Died 1915. Dau of John Hodgson Geldart & Esther Mary Buck. Married Ralph Whitaker. in 1864. He was a Farmer. MARY GELDART. Born C 1846 Kirkby Malzeard. Dau of Thomas of Azerley. RICHARD GELDART. Born Masham. He had a son James in 1760. Rev RICHARD JOHN GELDART. Died Nov. 1871 at Little Billing, Northamptonshire. He had been rector there since 1817. Brother of Rev.James Wm. of Kirk Deighton and Thomas Charles Geldart. Rev. RICHARD WILLIAM GELDART. Died April 1912 Clifton, Bristol. Son of Rev. James Geldart of Kirk Deighton. Educated at Cambridge and ordained in 1849. 1863-1910 Rector of Clyst St. Lawrence, Devon. THOMAS GELDART. Born 4 June 1748 West Tanfield. Son of William & Jane Ellerton. THOMAS GELDART. Born C 1811. Kirkby Malzeard. Widower in 1851. Living Braithwaite Hall, Azerley. Farmer of 250 acres employing 3 men. THOMAS GELDARD. Married 1860 Leyburn to Elizabeth Trenholme. THOMAS GELDART. Son of William. Married 31 March 1860 in Leeds to Esther Poulter. of Dishforth. He was a Railway Guard. In 1871 he was a station master. THOMAS CHARLES GELDART. Died 17 Sept. 1877. Master of Trinity Hall Cambridge. Married to Elizabeth. Uncle of Rev. James William & Henry Charles Geldart. The Geldart family had lived in the West Riding since the 14th century. Thomas used to travel between Yorkshire & Cambridge by stage coach. On his journeys he befriended an old gentleman with the same name as himself. When this gentleman died he made Thomas Charles his sole heir. Ref. Yorkshire Post Jan. 1930. WILLIAM GELDART. Born C1722 West Tanfield. * Died C1787. Married Jane Ellerton. WILLIAM GELDART. Bap 1786 Masham. Son of Thomas & Ann. WILLIAM GELDART. Born C 1803 Grewelthorpe. Married to Elizabeth of Sutton. In 1861 living with wife and his unmarried sister Elizabeth. Widower in 1871. 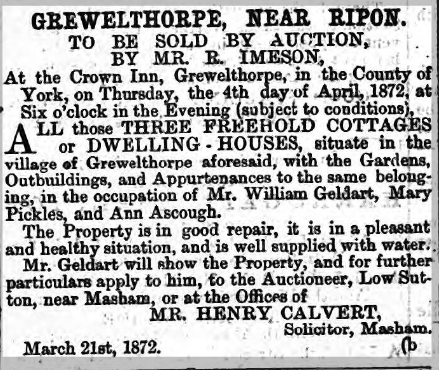 William selling his cottage in Grewelthorpe 1872. WILLIAM GELDART. Born C1864. Died Aug. 3rd 1941 at 69 Aismundersby Rd. Ripon. Married to Frances Annie. Notice in Knaresborough Post October 1876. ZENIE GELDART. only Dau of F.Geldart of Bishop Monkton. Married Robert Greaves. of Spofforth at Burton Leonard in March 1932. She was keen sportswoman. Sunday school teacher & member of Burton Leonard W.I.